A Rural Development Policy is in the offing as government works to complete its formulation to help achieve economic and social development for the rural residents, Mr Kojo Oppong Nkrumah, the Minister of Information, has announced. He said the Ministry of Local Government and Rural Development was wrapping up work on the Policy to ensure the provision of opportunities for all rural residents. 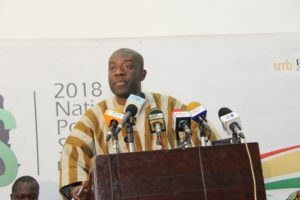 Speaking at a press briefing on Wednesday in Accra, Mr Nkrumah said the new Rural Policy was expected to provide a proper framework for addressing prevailing issues in Ghana’s rural development and the appropriate institutions to effectively respond to the challenges. “It will also serve as the single reference point for all ministries, departments and agencies whose activities and mandates impact on the lives of the people living in rural Ghana. All Metropolitan, Municipal and District Assemblies (MMDAS) will have responsibility for the implementation of the Policy,” the Minister said. He said series of stakeholder consultations had been concluded and the Policy, which would first receive Cabinet approval, would later be presented to Parliament for a national consensus to be built around it. The Policy would, among other things, provide a roadmap to systematically tackle issues such as high incidence of poverty, migration, inadequate employment opportunities in rural areas, low investment infrastructure as well as the high incidence of illiteracy and non-functioning of sub-district structures. It would also focus on agriculture, social services provision, industrialisation, financial inclusion and skills development as drivers of change in rural areas in Ghana. It would help in the utilisation of the potentials for rural development to tackle issues that would deliver the desired conditions for rural growth and development. “It is also our anticipation that the Rural Development Policy would additionally ensure the sustainability of government flagship programmes for the rural areas,” Mr Nkrumah added. Meanwhile, one of Ghana’s first attempts at a targeted rural development programme was in the 1970s during Prime Minister Kofi Abrefa Busia’s government. The aim of that Policy was to increase agriculture production, accelerate rural industrialisation, liberalisation of the economy and promote domestic entrepreneurship. Since then, Ghana’s rural development efforts had been chequered, Mr Nkrumah said. Touching on the 2019 Budget, Mr Nkrumah indicated that it is designed to bring more relief, hope and improvement in the standard of living of the people, as it would be without an IMF conditionality or supervision. “The 2019 Budget will mark the beginning of Ghana’s exit from the IMF programme under which we sought almost $918 million, over three years with conditions attached,” the Minister said. The Finance Minister is expected to read the Budget in Parliament on Thursday, November 15.